Councilman Gennaro, center, with supporters of his proposal to ban smoking in cars with minors. 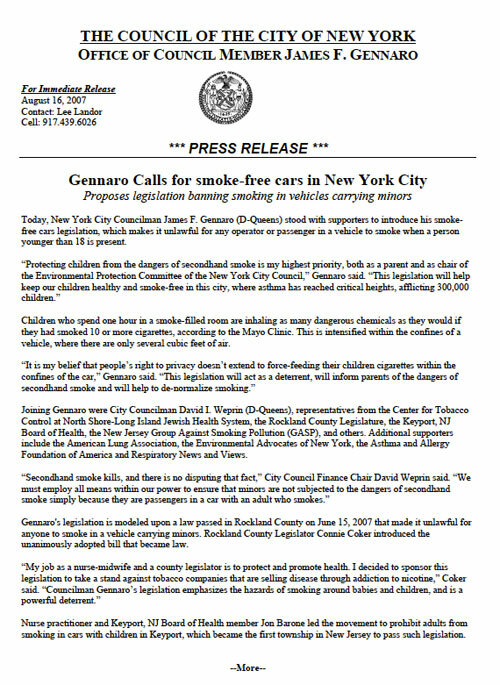 Councilman James Gennaro started a media frenzy when he proposed legislation to ban smoking in car with children under 18. 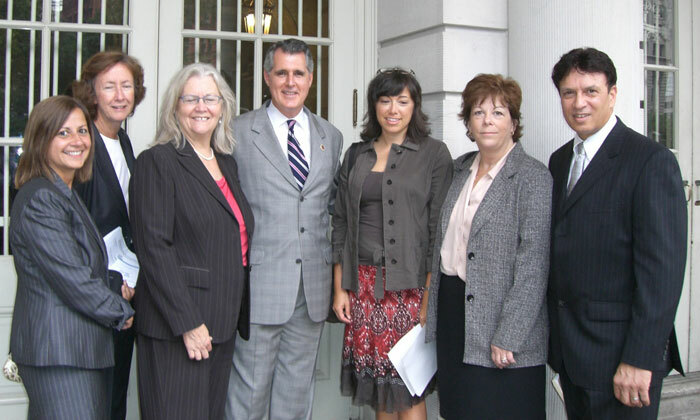 I wrote a long and informative press released on the reasons behind Gennaro’s decision to pursue the ban — after much research on the dangers of second-hand smoke, other legislatures around the country with similar laws and organizations that support such measures. I coordinated a press conference and released the media advisory two days prior. Members of the media pounced on the story immediately, bombarding me with calls and emails, requests for embargoed information and for interviews with Gennaro. On the day of the press conference, hundreds of people — members of the media, supporters and protestors — came out to the steps of city hall to hear Gennaro and several other lawmakers speak on the proposal. Within one day, the news spread internationally and everyone was talking about the councilman. He also appeared on NY1’s “The Call” with John Schiumo. Whether they supported Gennaro’s proposal or opposed it, he was the topic of discussion and brought awareness to an issue that was dear to him. Hundreds of news outlets and blogs covered the story and I interacted with almost every single one. I fielded calls, exchanged emails and arranged for the Councilman to interview as needed. Click on the image to view the press release in full.